A Europe without US support is militarily underfunded, unsure of its allies, wary of a genuine threat on its eastern border, and trying to hold itself together in the wake of the Brexit vote. So what are its options? We spoke to experts in Brussels, Berlin, London, and Washington to get an idea. However, an army like this would require changes to EU treaties. These changes would in turn have to pass through each of the 28 member states’ parliaments. No expert thinks that’s likely, given the unprecedented levels of skepticism on the continent currently towards the whole European project. That brings us to the next best option. Trump would normally first need to win approval in the Senate and to persuade Republican senators that the move is necessary and in the US’s long-term security interests. Ultimately, a decision by the White House to abandon Nato could be challenged legally and end up in the US Supreme Court. And with trump toadies Neil Gorsuch and Brett Kavanaugh in place, he might get his way. We are seeing growing evidence that goes well beyond mollification of Putin. 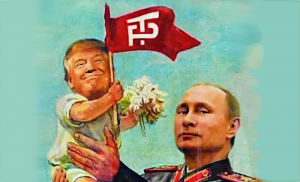 Trump and his fellow travelers are selling our nation out to a former KGB capo di tutti capi. The occupant of the Oval Office must be removed.